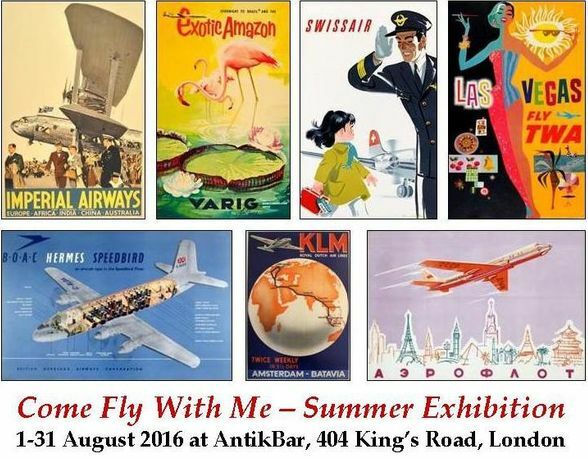 AntikBar, the original vintage poster specialist, will be holding a holiday-themed exhibition this August at their gallery on the King’s Road, London. AntikBar's summer exhibition will showcase a variety of flight-related travel, advertising and propaganda posters from around the world. These original vintage posters evoke strong feelings of nostalgia and truly capture the essence of travel in the earlier days of flying, many featuring airlines that no longer exist today. AntikBar specialises in original vintage posters covering a variety of subjects from around the world – travel, advertising, sport, cinema, war and propaganda – mainly from the late 1800s to 1970s. AntikBar offers worldwide delivery, collection advice, consultancy and search on demand services for collectors, individual clients and interior designers, as well as poster restoration services with their partners in California. Member of LAPADA, the Association of Art & Antiques Dealers, and the International Vintage Poster Dealers’ Association (IVPDA).